driveway pavers tampa is your solution! If you’ve started to see cracks in your driveway hardscape, and you’re thinking of getting it fixed, then consider driveway pavers instead. Pavers are a great way to enhance the look and feel of your driveway. Alongside this, they are extremely durable and long-lasting. This spares you from worrying about cracks and costly repairs. At Oliveira Pavers Services, we offer you the best driveway pavers. We provide you with the highest quality of products and paver services in the Tampa Bay area. We can give your driveway a new look and vibe in the fastest time while ensuring it lasts for years. At Oliveira Pavers Services, we strive for complete customer satisfaction. This is clearly evident from the way we serve and the products we use for creating beautiful yet durable hardscape for driveways. Our attributes like reliable services, quality pavers, professionalism, and affordable pricing have helped us become the first choice of driveway paving contractors among homeowners in Tampa. Our driveway paving installation team is highly-skilled, well-equipped, knowledgeable and experienced. Regardless of the project size, we make sure that every driveway is built to envy and designed for performance. At Oliveira Pavers Services, we never compromise on quality. Quality for us is a top priority for all the right reasons. First, driveways are prone to wear and tear because of foot traffic and vehicles, so it’s extremely important that they are resilient and durable. We also ensure that the paver is of the highest quality so it can withstand the Florida heat and sun. We make sure that we only provide our customers with top quality driveway pavers with exceptional durability & beauty. We offer you three top quality paver options to choose from— interlocking pavers, travertine and brick. Interlocking pavers simulate cobblestone pathway effect and are easier to install compared to other paver. They can be fixed without the use of mortar. Other than easy installation, they are also modular. This means that they can connect together easily to form various kinds of geometric designs, thereby enhancing the aesthetics of your driveway. They also have the ability to transfer load over a large area, which lowers the stress allowing heavy vehicles to move around and stand without damaging the hardscape. Travertine is also among the best driveway pavers Tampa. It is a natural stone with a unique finish and texture. It is durable and can give a beautiful rustic feel to your driveway. Travertine pavers are available in a variety of eye-catching designs and patterns, making them a perfect choice for homeowners who want to beautify their driveways in the shortest time and cost-effectively. 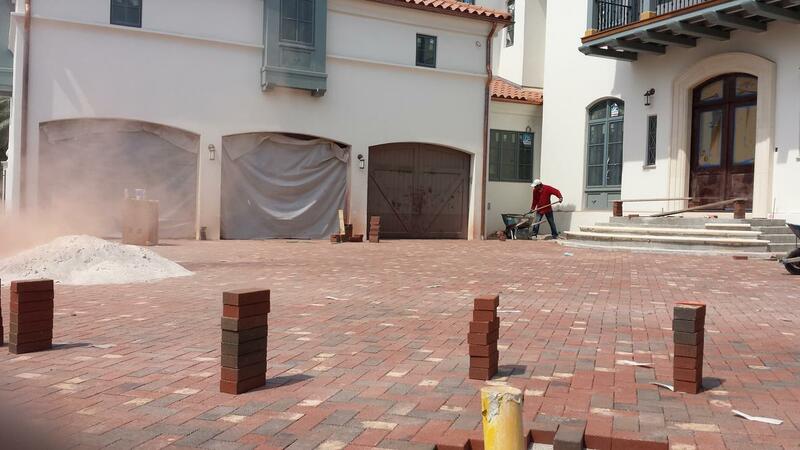 At Oliveira Pavers Services, our driveway paving contractors are also experienced in installing brick pavers. Brick pavers are a 10 on 10 on practically every factor including durability, versatility, strength, integrity, aesthetics and slip-resistance. Additionally, once installed, you don’t have to worry about their maintenance predominantly because brick pavers are low maintenance. No matter which of the modern driveway pavers you choose, the good news is that they are also easy to repair. With our Driveway Pavers Tampa service, it’s a one-time investment that can last for several years. Though very rare, even if minor cracks do occur on your hardscape, these pavers can be repaired quickly, thereby restoring the beauty of your driveway right away. At Oliveira Pavers Services, we work with you cohesively and strive to transform your vision into a reality. Our team works on every driveway paving project with full-zeal and enthusiasm which is depicted through our quality of workmanship. If you are ready to give your driveway a new look and enhance its visual appearance, then get in touch with us today. Call us at (727)-417-8302 to schedule for services. Discuss your needs and preferences with us and we’ll provide you with the best solutions and services. Let’s start a conversation today. Call us at (727) 417-8302 to discuss your paving needs. And we’ll provide you with the best service at an affordable price. You’ll be amazed with the final look of your hardscape. Copyright © 2018 Oliveira Pavers All Rights Reserved.